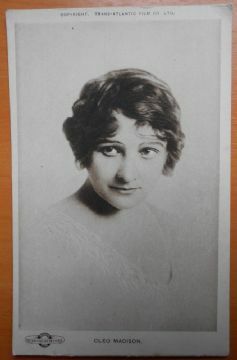 Vintage Postcard from 1915 showing the actress Cleo Madison. She was a theater actress before getting into the film business during the years 1912-1924. Nice vintage postcard. The postcard measures 5.5" x 3.5" and is in VG-Fine condition. There is the tiniest edge wear. It has the standard postcard backing and there is no hand writing on the back. See larger picture for more detail. The above shipping fees relate to any amount of postcards or flat items* you purchase. If you buy 20 postcards at one time you will only pay the shipping fee stated above. * if you purchase a rolled item and a flat item ( lobby cards & film stills ) this will incur Two shipping charges. If you buy 20 flat items ( lobby cards, film stills or folded posters ) you will pay one shipping charge at the highest shipping cost, this is also the same if you buy 20 rolled posters. Please check back or bookmark the store as i have thousands of postcards, rare posters and lobby cards to list.